Welcome to Kawawii Island, a paradise resort where friends and family can enjoy 50+ co-op and competitive activities. There are all sorts of exciting ways to explore the island, from horseback to buggies, snow mobiles to inline skates. And to add to the fun, up to 4 players* can enjoy visiting and discovering every corner of the island together! If you're playing multiplayer, each player can use just one Joy-Con™ controller. Experience hours of fun and something new every day. Customize your character, costumes, vehicles and even pets! Daily presents and challenges mean that you will want to keep coming back to the island of Kawawii to explore more terrain and play through activities all over again. Mii or in-game characters of friends and family may show up, and if they do, you can compete against them anytime. Or customize your very own villa by earning over 450 pieces of furniture. 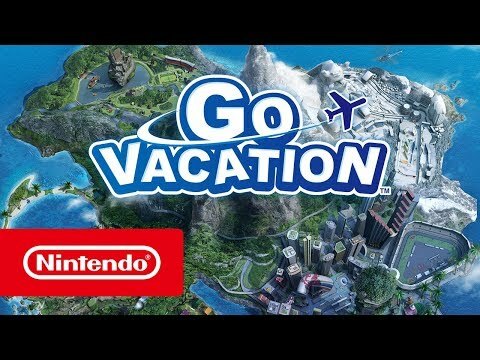 Go Vacation was released on Switch 267d ago in the US and the UK. Notify me when Go Vacation is available. Based on 6 Go Vacation reviews, Go Vacation gets an average review score of 56. If you are in need of a true multiplayer journey, you can do a lot worse than this fine package. Go Vacation is a solid destination to visit - whether on a solo trip or having a bunch of friends tag along for the journey. It won't keep multiplayer parties going on all night long, but it'll certainly get pulled out whenever I have four players to keep entertained.